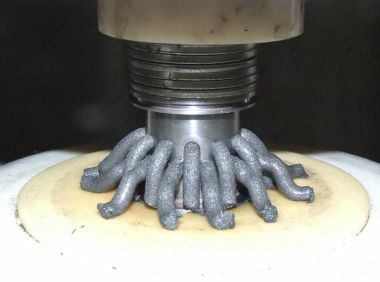 So What's the Best Way to Efficiently Produce Burr-Free Surfaces? For today's manufacturers of precision components, there's no getting around deburring, rounding and polishing. These production steps are often seen as a necessary evil due to the high costs associated with them in some cases. Choosing the right technology is key to reliable processing at reduced costs. It's practically impossible to fully avoid the occurrence of burrs when using any of the traditional metalworking processes. Due to the fact that these manufacturing or processing remnants represent a risk from both a functional and an ergonomic standpoint, they have to be removed. In the case of surf finishing by means of which the workpiece is guided by a robot through a rotating bowl filled with grinding medium, certain areas can be processed selectively. As was also the case in days of old, this is frequently still done manually. Quite apart from the fact that the necessary process reliability and reproducibility is not assured, this manual work results in high costs and often leads to time-consuming rework -- in both cases at the expense of economic efficiency and the company's competitive edge. And thus it's no wonder that deburring, rounding and polishing are often seen as a necessary and costly evil. More and more demanding requirements for process reliability in production and product quality, as well as cost pressure in global competition, necessitate more economic efficiency for the manufacturing steps of deburring, rounding and polishing. At the same time, uniform high quality must be assured in a reproducible manner. Various processes have established themselves to this end, for example automated brush deburring, deburring with special tooling which is integrated into the machining centers, barrel finishing and high-pressure water jets. Many of these processes have been further developed in recent years, and new technologies have been introduced to the market as well. 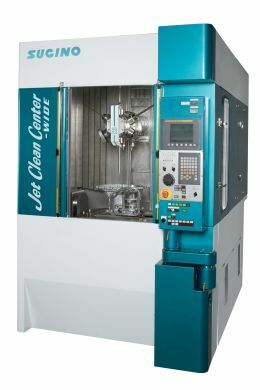 Various developments such as drag finishing and so-called surf or stream finishing make reliable and economical lot processing by means of barrel finishing possible for parts which are sensitive to damage and could previously only be deburred, ground, polished or smoothed by means of a costly, non-reproducible manual procedure or at great expense with the help of a machine. Thermal energy machining fully removes all burrs within just a few milliseconds (left). The roots of the burrs are sealed as well (right). In the case of drag finishing, the parts are clamped to workpiece carriers which are then dragged through a barrel with abrasive particles or a polishing medium. Uniform flow of the abrasive particles or polishing medium around all sides of the workpieces results in effective but nevertheless gentle processing. Even in the case of workpieces with complex geometries, ideal, reproducible processing results of "handmade quality" can be achieved within a relatively short period of time. Surf or stream finishing goes one step further. 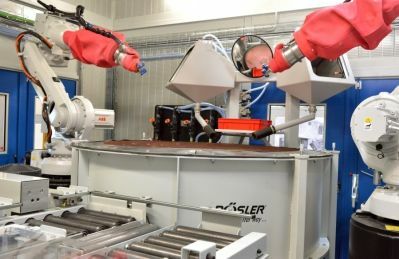 A robot immerses the workpiece at a precisely defined position into the rotating bowl which is filled with grinding medium, and accurately guides it. This makes it possible to selectively process certain areas, or different radii can be achieved by variously positioning the robot arm. High grinding pressure is generated by rotating the bowl while the component is surfing in the grinding medium. This results in intensive, reliable processing with short cycle times and a surface finish which complies with the specified requirement. Not every burr on a geometrically complex workpiece is easy to reach. Thermal energy machining (TEM) makes it possible to remove burrs reliably, efficiently and with consistently high quality where mechanical processing would be either uneconomical or not possible at all. It's suitable for components made of nearly all metallic materials and thermoplastics from which internal as well as external burrs need to be removed -- even from very difficult to access places. New TEM systems with rectangular deburring chambers simplify parts handling and allow for new applications. The parts are positioned inside a bell-shaped chamber for the deburring process, which is hermetically sealed. A precisely defined mixture of gases (e.g. oxygen and methane) is fed to the chamber by means of a gas metering system. It flows through the entire component, or the complete batch. Upon ignition of the gas mixture, burning ensues resulting in temperatures ranging from 2500 to 3300°C. The burrs reach ignition temperature and react with the excess oxygen. This causes complete combustion of all burrs within approximately 20°ms, and their roots are also sealed as a result. Due to the fact that the process lasts just a few milliseconds, the workpieces are only heated up insignificantly. No material is removed from the surface. Overall cycle time is usually less than two minutes. 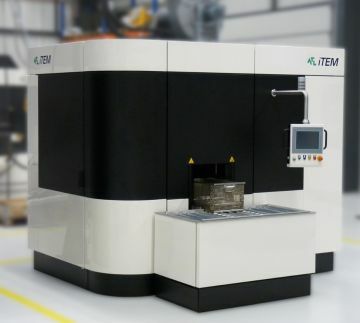 TEM makes it possible to achieve "sharp-edged / burr-free" deburring quality. Depending on the material, slight rounding of the edges is also possible. 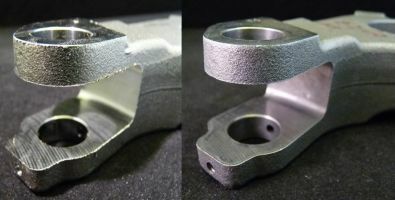 Use of this process is limited by the size of the part, as well as in the event that targeted edge rounding needs to be achieved during deburring. In the case of abrasive flow machining, processing is accomplished by means of abrasive particles which are embedded in a polymer plastic mass of defined viscosity. TEM systems with rectangular deburring chambers are a new development. They are used, for example, to deburr die-cast zinc and aluminium parts as bulk goods. Parts handling is significantly simplified and accelerated as a result, because the loaded container can be transferred directly to a parts cleaning system after TEM deburring. Another possible application for systems with rectangular chambers is the deburring of aluminium cylinder heads. Contactless electrochemical machining (ECM) demonstrates its strengths in this respect. The process is based on the principle of electrolysis. A cathodic electrode used as a tool is connected to a source of direct current. The other electrode is the anodic workpiece itself. A charge exchange between the cathode and the workpiece takes place in an aqueous electrolyte solution and processes the workpiece in a targeted fashion. On the one hand, this makes it possible to reliably deburr difficult to access areas such as edges, undercuts, internal bore intersections and pockets at precisely defined location on the workpiece. Casting, press moulding and forging flash can also be removed. On the other hand, ECM also makes it possible to produce, for example, highly precise contours, ducts, slots and hollows in a reproducible manner without any thermal or mechanical stressing. And thus the ECM process fulfils the more and more frequently specified requirement for burr-free processing -- with a high quality surface finish as well. In this system for high-pressure water jet deburring, CNC positioned nozzles remove chips and burrs from cross-holes, threaded holes and deep holes, as well as from inside the workpiece. This is also one of the characteristics of abrasive flow machining, by means of which Ra values off less than 0.01° µm can be achieved. The process is used for economically efficient deburring, edge rounding and polishing of internal and external surfaces of demanding components from the automotive and aviation industries, turbine manufacturing, medical and fluid engineering, mould and toolmaking, general machinery manufacturing and other industry sectors. Processing is accomplished by means of abrasive particles, the type, size and concentration of which are matched to the respective task, and which are embedded in a polymer plastic mass of defined viscosity. This grinding medium is caused to flow through or over the area of the component to be deburred in alternating directions at a defined pressure level by means of hydraulically powered pistons. Deburring, cleaning, rounding and hardening of the surface in a single step is made possible by the so-called Pinflow process. The workpieces to be processed are clamped in a part-specific fixture which is laid out as a container, is filled with a processing medium (small steel balls) and is located in the machine's process chamber. Vibrators then cause the fixture to oscillate horizontally, thus resulting in relative motion between the workpiece and the deburring medium. The resultant kinetic energy of the steel balls is transferred to the workpiece in order to process its external and internal surfaces, and the deburring effect is also apparent in difficult to access places. Which processes ensure efficient deburring and surface finishing with good process reliability? Which new technologies are available for deburring, rounding and polishing? Which measures contribute to the reduced formation of burrs? Answers to these and many other questions are provided by DeburringEXPO. The 2nd DeburringEXPO will take place at the Karlsruhe Exhibition Center in Germany from October 10th -- 12th.